- Alaska fall landscape photos, scenic photos of autumn colors. Fall colors on the tundra, foliage on trees in forests during fall, Alaska fall colors, the Rocky Mountains in autumn, southern appalachian mountains in fall. Alaska landscape photos. The Russell Glacier, Mt. Bona photo, Wrangell - St. Elias National Park, Alaska. Mt Sanford, tundra, fall colors, Wrangell St. Elias, Alaska. Northern lights, Wrangell - St. Elias National Park and Preserve, Alaska. Kuskulana River sunrise, Wrangell - St. Elias National Park, Alaska. Fall colors photo, boreal forest, Wrangell - St. Elias National Park, Alaska. Aspen trunks, fall colors, Wrangell - St. Elias National Park, Alaska. Mount Blackburn, Wrangell - St. Elias National Park and Preserve, Alaska. Fall colors, taiga, Wrangell St. Elias National Park, Alaska. Kuskalana Bridge, Wrangell - St. Elias National Park, Alaska. Fall colors, Wrangell - St. Elias National Park and Preserve, Alaska. Alpenglow on Denali, Mt. McKinley, Denali National Park, Alaska. Fall colors, Wrangell St. Elias National Park, Alaska. Vermillion Lakes, Banff National Park, Alberta, Canada. Mt Edith Cavell picture, Jasper National Park, Canada. Fall color, Wrangell St. Elias National Park, Alaska. Thompson Ridge, Wrangell St. Elias National Park, Alaska. Fireweed Mountain, reflection, fall, Wrangell - St. Elias National Park, Alaska. Mt. Sanford, Wrangell - St. Elias, Alaska. Copper River and Wrangell Mountains, Alaska. Mount Sanford, Wrangell - St. Elias National Park and Preserve, Alaska. Sunrise, Arrigetch Peaks, Gates of the Arctic National Park and Preserve, Alaska. 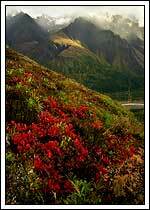 Caliban, Arrigetch Peaks, Gates of the Arctic, Alaska. Arrigetch Creek, fall color, Gates of the Arctic National Park, Alaska. Waterfall and sunset, Wrangell - St. Elias National Park and Preserve, Alaska. Wildflowers (Wild Sweet Pea, Hedysarum Mackenzii) and icebergs, Nizina Lake and Nizina Glacier, Wrangell - St. Elias National Park and Preserve, Alaska. Mount Sanford at sunrise, Wrangell - St. Elias National Park and Preserve, Alaska. Kettle pond, Wrangell - St. Elias National Park and Preserve, Alaska. Fall color, Amicalola Falls State Park, Amicalola Falls overlook, Georgia Mountains. Fall colors in forest Amicalola Falls State Park, North Georgia Mountains. fall color, aspens, hardwood forest, British Columbia, Canada. Fall colors glow in the Cohutta Wilderness, North Georgia Mountains. Sugar maple photo, Jack's River, Jack's Falls, Cohutta Wilderness, Georgia. Boreal forest, fall colors, Denali National Park and Preserve, Alaska. Fall colors, tundra and boreal forests, Denali, Alaska. Mt Edith Cavell photo, Jasper NP, Canada. Fall color, Jasper photos, Alberta, Canada, Canadian Rockies. Strawberry leaf on moss, Jasper National Park, Alberta, Canada. Strawberry leaf and quaking aspen leaves on moss, Jasper Canada. Little Tennessee River, fall, Western North Carolina mountains. Pyramid Mountain photo, Jasper NP, Canada. Pyramid Mountain picture, Jasper NP, Canada. Mount Blackburn, Wrangell St. Elias National Park, Alaska. Forest, fall color, Yukon Territories, Canada. Bull elk, Yukon Territory, Canada. Chattahoochee National Forest, Atlanta, Georgia. Fall, tundra, Wrangell - St. Elias National Park, Alaska.